As ANZAC day approaches we remember all those who have served and continue to serve in Australia's armed forces. The Southern Star Group is proud to support The Salvation Army hosting a commemorative concert this ANZAC Day eve. 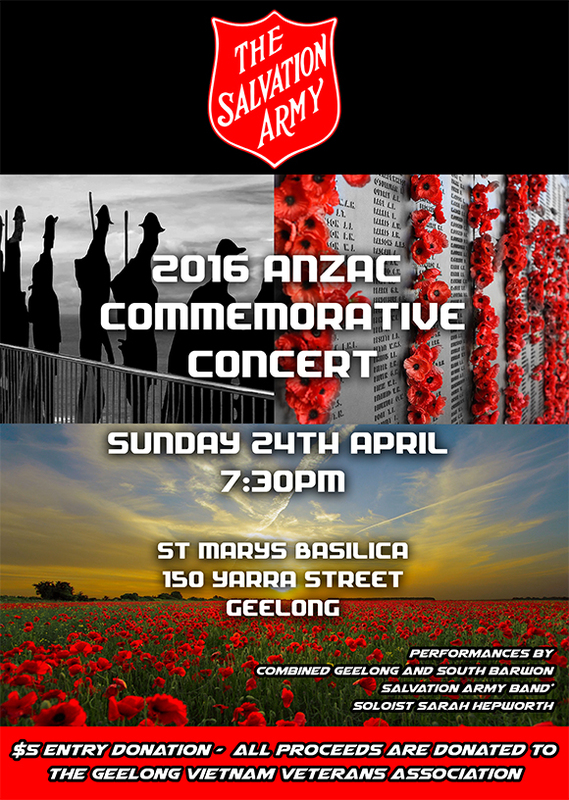 The Geelong and South Barwon Salvation Army bands will host an evening of commemoration with performances of classic Anzac songs and tributes set to take place at St Marys Basilica Sunday 24th April. Famed soloist Sarah Hepworth will also be performing amongst speeches from key members of the community and sing-alongs for all to join in with. The evening will commemorate the ill-fated World War II 2/22nd Battalion, which itself consisted of a regimental band. Twenty-three members of the band were originally members of Salvation Army bands who had enlisted in 1940. Amongst them were Acting Corporal Wilfred Ernest Trigg and Private Francis Roy Meddings who were locals from Geelong. The battalion served as a garrison force at Rabaul, New Britain, until 23rd January 1942 when Japanese troops stormed ashore in the early hours of the morning, capturing and killing many soldiers. Most of the band died at sea on 1st July 1942 when the Montevideo Maru, carrying an estimated 845 POWs and 209 civilians from Rabaul, was sunk off Luzon in the South China Sea by the United States Navy submarine USS Sturgeon. Of the 24 band members who enlisted, Private Frederick William Kollmorgen was the only one who survived the deployment to New Britain. The Salvation Army invites all to attend the event and join in commemorating the service and sacrifice of these brave souls. The evening commences Sunday 24th April at 7.30 pm.